Front row (left to right): 1. Marilyn Steele, 2. Delia Jeffery, 3. Louise Orman or Walker, 4. Susan McLaughlin, 5. Susan Hahn, 6. unidentified, 7. unidentified, 8. Janet Mooney?. Second row: 1. Gary Butterfield, 2. Lois Anderson, 3. Elsie Yarborough?, 4. Geraldine Jones, 5. Mary Ruth Wallace, 6. unidentified, 7. Margaret Vargas, 8. Paul Chaplic. Third row: 1. Bill Leeds, 2. unidentified, 3. Bill Fisk, 4. Dennis Richardson, 5. Jim Nickerson, 6. Alan Shelly, 7. Wally Walker or Norman Anderson. Fourth row: 1. Hughlin Kiley (Whittle)?, 2. Charles Sage, 3. Larry Waters, 4. Ron Acciolli, 5. Paul or James Armstrong, 6. Jim Strom, 7. unidentified. Credits: From the collection of Susan (McLaughlin) Beus. 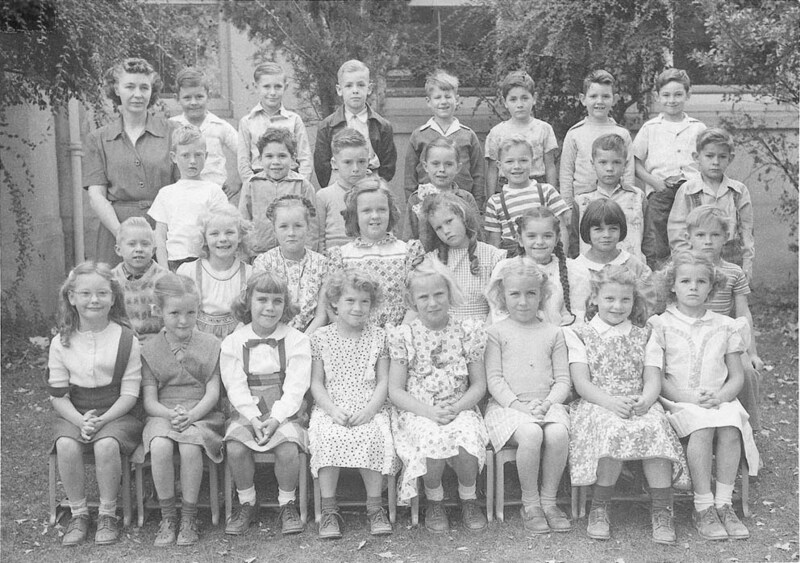 Thanks to Susan (McLaughlin) Beus, Delia (Jeffery) Ingersoll, and Alan Shelly for identifying the kids in this picture.